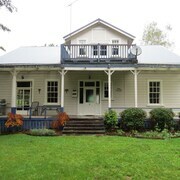 Situated in Raetihi, this cottage is close to Raetihi Show Ground. Area attractions also include Ratana Church. School Holidays Availability... Book Now! 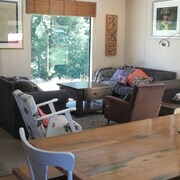 Very clean, well decorated in a beautiful location and scenic views. The restaurant and bar did great food and were a nice way to relax at the end of the day by the open fire. Good value for a mid-range motel. Close to cycle trails. Mt Ruapehu looms in the near distance. Where to find Raetihi hotels near an airport? Where can I find hotels in Raetihi that are near tourist attractions? If you are heading to North Island and are after an Expedia-listed room in Raetihi, there are a small number of options. Within 0.1 kilometres (0.06 miles) of the city center, you can find 2 Expedia-listed hotels and apartments. There are a range of Expedia accommodations within driving distance, such as the Snowy Waters Lodge and The Old Courthouse B&B. The Tussock Grove Boutique Hotel can be found 18 kilometres (11 miles) from the heart of Raetihi. 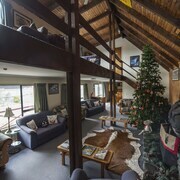 Another option is the Ohakune Court Motel, which is positioned 18 kilometres (11 miles) away. 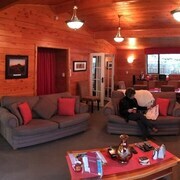 Alternative Expedia-registered hotels are the Ruapehu Mountain Motel & Lodge and the Station Lodge - Hostel/Backpacker. After you have explored Raetihi, why not tour a little further afield? The North Island region has plenty of attractions. Nature lovers will appreciate North Island's beaches, coastal plains and forests. You could also visit some of the area's art museums. Popular activities in this particular part of New Zealand include snowboarding and skiing. Looking for things to do? Consider spending some time discovering Rangaroa Domain and Taumarunui Golf Course, which you'll find in Taumarunui, 65 kilometres (40 miles) to the north of Raetihi. Some of our recommended Taumarunui hotels are the Forgotten World Motel and Bradleys Garden Bed & Breakfast. 80 kilometres (49 miles) to the west of Raetihi, you can also stay at Hawera, home to the Tairoa Lodge & Cottage and Hawera Central Motor Lodge. The Tawhiti Museum and King Edward Park are just some of the more popular attractions to experience in Hawera. For those travelers planning on arriving via Wanganui Airport, you may choose to book some accommodation at Aotea Motor Lodge, or 151 on London Motel, both of which are close by. What are the most popular Raetihi hotels? Are there hotels in other cities near Raetihi? 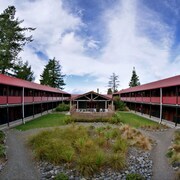 What other types of accommodations are available in Raetihi? Explore Raetihi with Expedia.ca’s Travel Guides to find the best flights, cars, holiday packages and more!